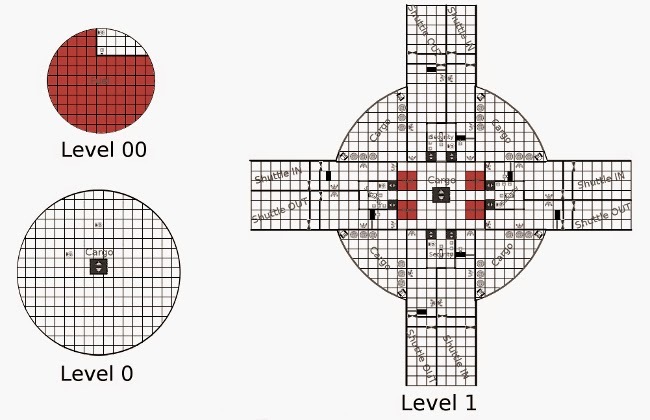 Last time in The Maps of Interstellar Exports Part I I introduced the Galactic Sub-sector that JADE's Traveller Campaign takes place in, and the systems that my players had visited. This time around I am going to show you a specific system, and the planets within. Interstellar Exports started in the Orion XII system in 0810. There are dozens of Orion systems littered across the galaxy. Each of these feature a massive Orion Class Space Station. These stations were designed as a rest stop for travellers, as well as a place to refuel, trade etc. 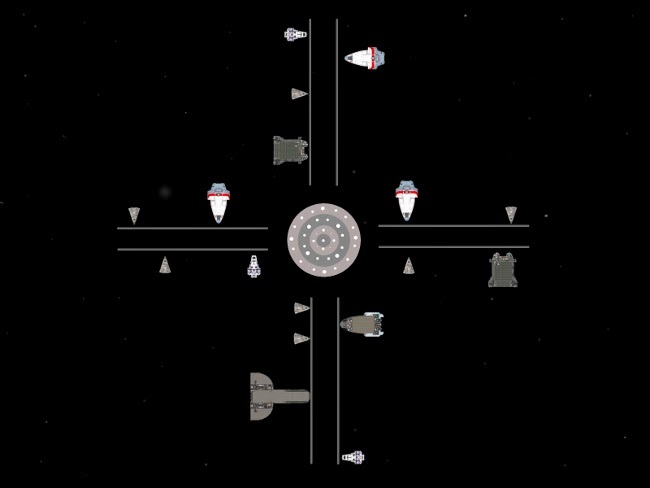 Each Orion Class Station has an interior docking ring for smaller ships, and hold larger ships in an outer orbit. Shuttlecraft are used to ferry patrons to and from the station. Orion Class stations are well policed making them safe harbours. 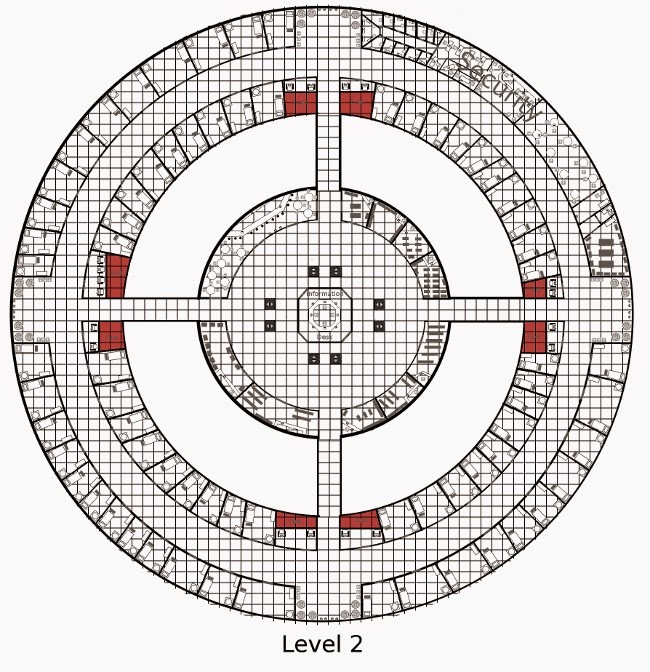 The lower levels of the Orion class stations are reserved, for Fuel, Cargo, and Customs. Anyone or thing wishing to enter or leave an Orion Class station must pass through one of the four customs check points. 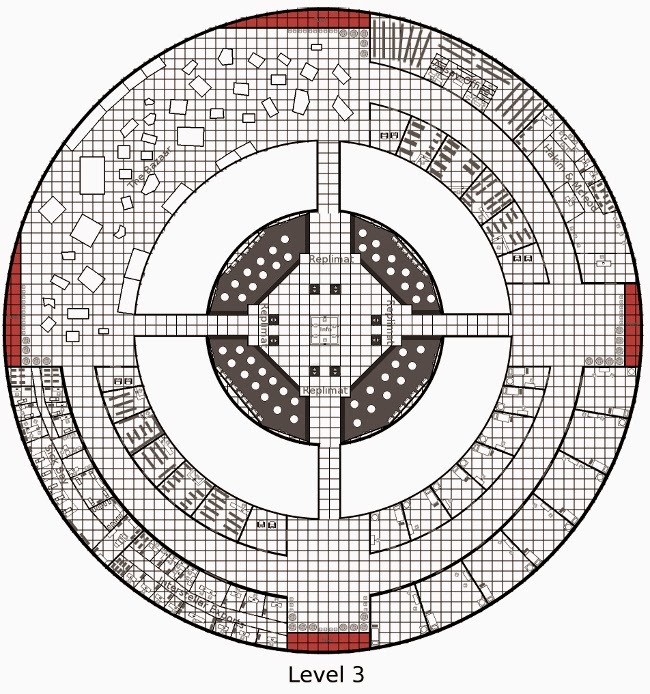 The second level of the Orion Class Station, houses the rooms for rent, as well station security and a couple of shops and stores. The most notable establishment is Screeve's bar, where Elijah's first Traveller character James Hornby drowned his sorrows. 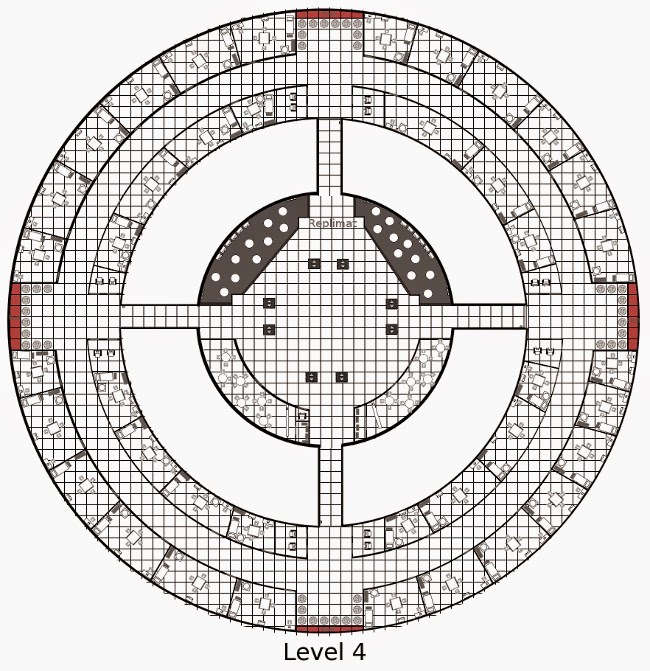 The third level contains the main replimat: a free service provided by the station, using matter replicators to create food. While being a free service, the food is considered quite vile, and there are of course several other restaurants around the station. This level also houses, The Station's sick bay, the Interstellar Export's office for the sector, and the bazaar. The Bazaar spans a full quarter of the third level and is mostly open space. Shop keepers can register a stall with station security, but over the years, this became more of a curiosity then a rule. You can find anything at a Orion Class Station Bazaar. The heavy ship traffic means that the wares change from day to day. For those that wish to take up permanent residency on the Orion Stations, the fourth level features several large suites which are available for sale. The permanent habitat ring is divided from the rest of the station by security doors, which require a thumb print to access them; making it one of the safest place on the station. In the centre there is another replimat, as well as two finer restaurants. The restaurant on the left is Blarn's Fine Geelosian Eatery, which both Elijah and Dave's Character's James and Dry visited in Interstellar Exports Game 1. Geelosian food is quite strange and expensive, but Dry enjoyed himself. James on the other didn't have the stomach for it. the Stations Fifth and sixth levels are for station personnel, and station operations. To access these levels you must submit a valid thumb scan. 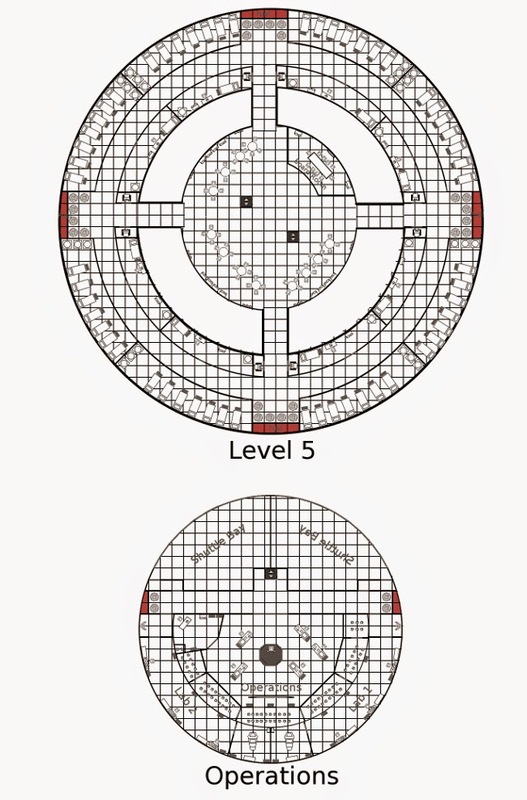 I put a lot of work into creating the Orion Class stations, and the guys spent two entire game sessions wandering all over the place. I think it was time well spent. 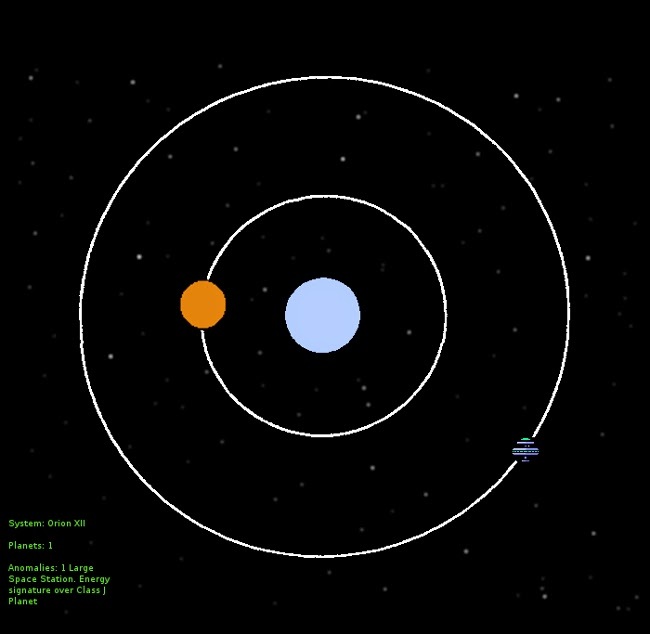 The only planet in the Orion XII system is a gas giant called Jupiter 5. It is fairly unremarkable, but has mining station in orbit. The station extracts valuable chemicals from the atmosphere, which can easily be refined into starship fuel. And since I can't design every station from scratch, thanks to thegGuys at Mongoose Publishing. 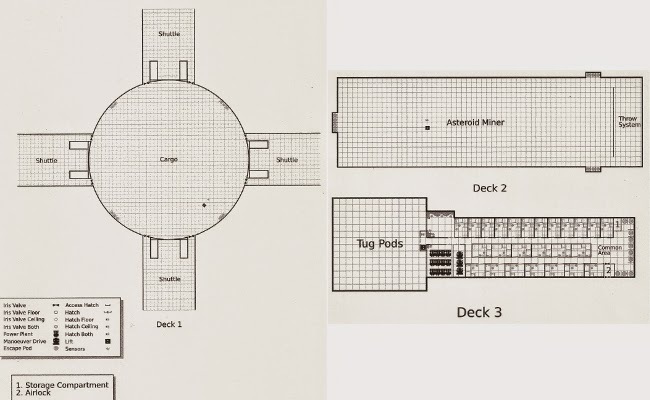 This is a mining station floor plan is from their Traveller Supplement 14: Space Stations. Hope you enjoyed these maps! Next time we will take a look at system 0809, and continue our interstellar tour.